biplot(coefs) creates a biplot of the coefficients in the matrix coefs. The biplot is 2-D if coefs has two columns or 3-D if it has three columns. The axes in the biplot represent the columns of coefs, and the vectors in the biplot represent the rows of coefs (the observed variables). biplot(coefs,Name,Value) specifies additional options using one or more name-value pair arguments. For example, you can specify 'Positive','true' to restrict the biplot to the positive quadrant (in 2-D) or octant (in 3-D). 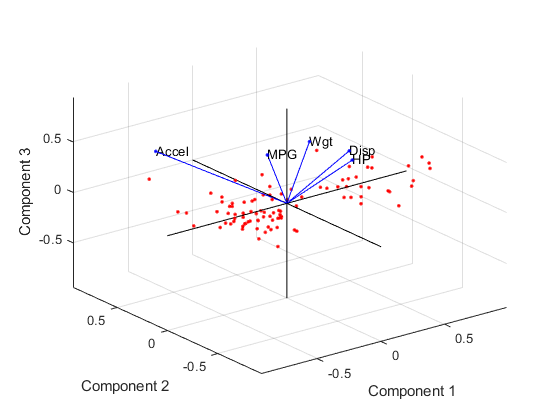 h = biplot(___) returns a column vector of handles to the graphics objects created by biplot, using any of the input argument combinations in the previous syntaxes. Use h to query and modify properties of specific graphics objects. For more information, see Graphics Object Properties (MATLAB). Create a biplot of the first three principal component coefficients, the observations, and the observed variables for the carsmall data set. Create a matrix consisting of the variables Acceleration, Displacement, Horsepower, MPG, and Weight. Delete rows in the matrix that have missing values. 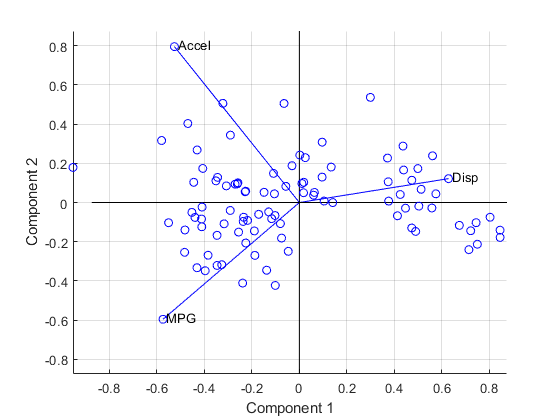 Standardize X and perform a principal component analysis. The 5-by-5 matrix coefs contains the principal component coefficients (one column for each principal component). The matrix score contains the principal component scores (the observations). 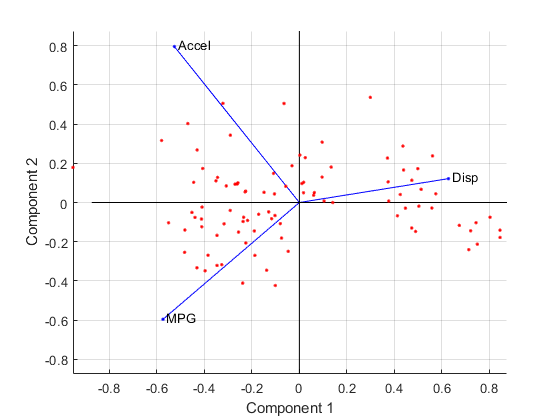 Create a biplot of the first three principal component coefficients. The axes of the biplot represent the columns of coefs, and the vectors in the biplot represent the rows of coefs. Create a more detailed biplot by labeling each variable and plotting the observations in the space of the first three principal components. Control the appearance of a biplot by specifying supported line property names and values, and by using handles to the graphics objects created by biplot. Create a matrix consisting of the variables Acceleration, Displacement, and MPG. Delete rows in the matrix that have missing values. The 3-by-3 matrix coefs contains the principal component coefficients (one column for each principal component). The matrix score contains the principal component scores (the observations). 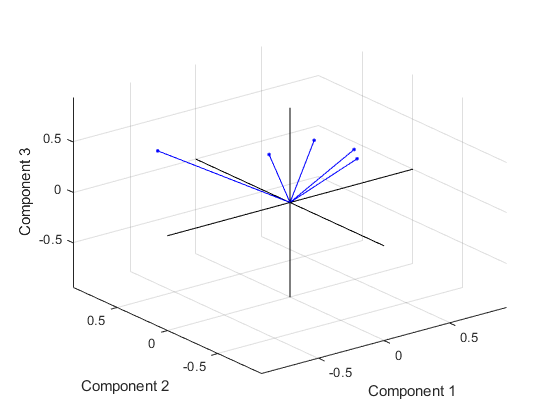 Create a biplot of the observations in the space of the first two principal components. Use the default properties for the biplot. h is a vector of handles to graphics objects. You can modify the properties of the line objects returned by biplot. Label the three variables for easy identification. Specify circles as the marker symbol and blue as the line color for all line objects. h1 is a vector of handles to graphics objects. View the first few elements of h1. The handles for the variable labels (h1(7:9)) are text. Therefore, the settings specified for the line properties do not affect these labels. 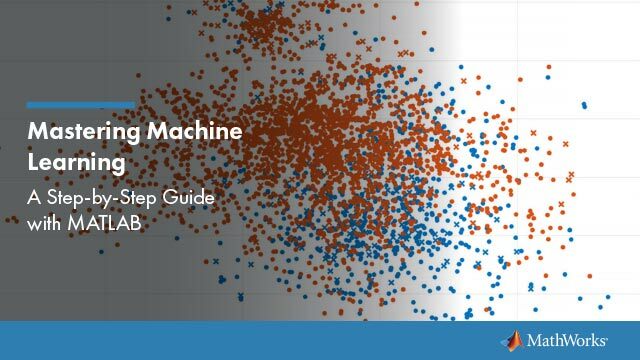 Create another biplot of the observations in the space of the first two principal components, and label the three variables for easy identification. h2 is a vector of handles to graphics objects. View the first few elements of h2. h2 contains 104 object handles. The first three handles (h(1:3)) correspond to line handles for the three variables. Handles h(4:6) correspond to marker handles for the three variables. Handles h(7:9) correspond to text handles for the three variables. The next 94 handles correspond to line handles for the observations. The last handle corresponds to a line handle for the axis lines. Modify specific properties of the biplot by using handles to the graphics objects. Change the line color of the variables (vectors). Modify the font of the variable labels. Change the color of the observation markers. Coefficients, specified as a matrix that has two or three columns. If coefs has two columns, then the biplot is 2-D; if coefs has three columns, then the biplot is 3-D. The columns of coefs usually contain principal component coefficients created with pca or pcacov, or factor loadings estimated with factoran. 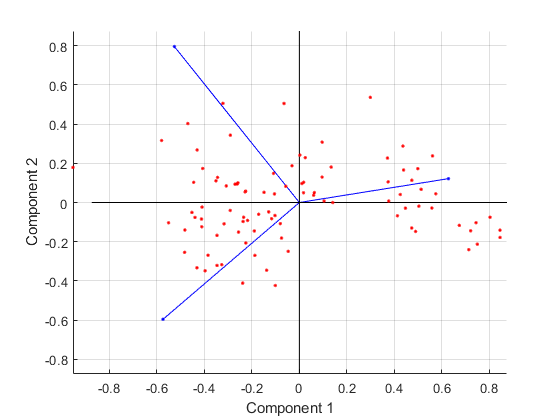 The axes in the biplot represent columns of coefs, and the vectors in the biplot represent rows of coefs (the observed variables). Example: biplot(coefs,'VarLabels',varlabels) labels each vector (variable) with the text in the array varlabels. Scores, specified as the comma-separated pair consisting of 'Scores' and a matrix with the same number of columns as coefs. Scores usually contains principal component scores created with pca or factor scores estimated with factoran. The biplot function represents each row of Scores (the observations) as points and each row of coefs (the observed variables) as vectors. Variable labels, specified as the comma-separated pair consisting of 'VarLabels' and a character array, string array, or cell array. biplot labels each vector (observed variable) with the text in the array. Observation labels, specified as the comma-separated pair consisting of 'ObsLabels' and a character array, string array, or cell array. biplot uses the text in the array as observation names when displaying data cursors. Indicator for plotting in the positive coordinates, specified as the comma-separated pair consisting of 'Positive' and one of these logical values. Property name, specified as the comma-separated pair consisting of a property name and its associated value for one or more supported Line Properties. These properties are the names and values for all primitive line graphics objects created by biplot. The specified property names control the appearance and behavior of the graphics objects. You can use the handles to query and modify properties of specific graphics objects. See Graphics Object Handles (MATLAB) and Graphics Arrays (MATLAB) for more details. Imposes a sign convention, forcing the element with the largest magnitude in each column of coefs to be positive. This action flips some of the vectors in coefs to the opposite direction, but often makes the plot easier to read. Interpretation of the plot is unaffected, because changing the sign of a coefficient vector does not change its meaning. Scales the scores so that they fit on the plot. That is, the function divides each score by the maximum absolute value of all scores, and multiplies by the maximum coefficient length of coefs. Then biplot changes the sign of the score coordinates according to the sign convention for the coefficients.